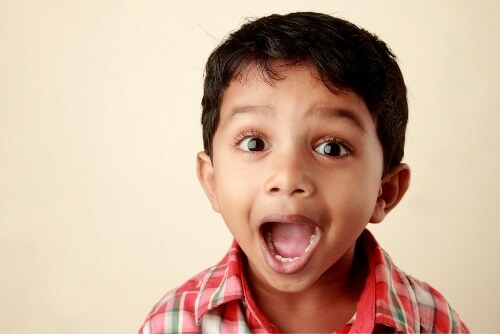 22 Chinese Interjections You Oughta Know! Finding a quick, appropriate response during a conversation can be challenging when developing ability in a new language. Sometimes called “rejoinders,” these short, responsive words and phrases can be used to express comprehension and give an emotional response: sympathy, pity, surprise, joy, awe or thanks. Even before you speak fluently, being able to use some of these phrases helps you connect with others in conversation. These relatively short phrases show that you can understand more than might roll off your tongue (yet), assuring Chinese listeners you’re with them in conversation nonetheless. One of the difficulties of beginning to intermediate Chinese ability is that you may understand more of what you hear than you can really respond to fully and fluently (yet!). Quick, brief responses to what others have said helps to overcome that gap. 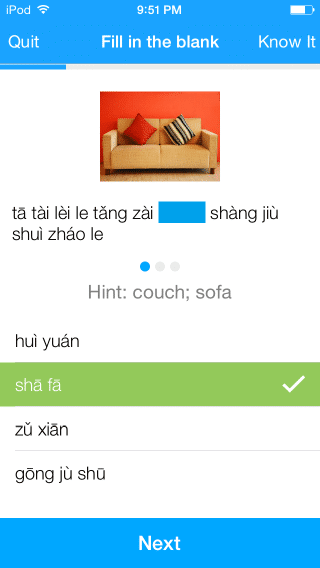 Interjections and rejoinders add a more natural feel to your Chinese. These are common phrases I acquired mostly by hearing Chinese friends use them again and again, and eventually became part of my own spoken Chinese. Instead of trying directly to translate English phrases you might think of using in similar circumstances, try using some of these. Responses like those listed below can also help keep conversations going. They demonstrate reflective listening—that is, they show you’ve heard the other person and acknowledged some degree of what they’re feeling. They may even help you bridge the social distance many of us non-native speakers seem to encounter when speaking another language. These phrases, when used as native Chinese speakers do, breaks down some of the awkward feeling of not being sure what to say. For an example of how a Spanish teacher uses rejoinders to build community in his classes, check out Grant Boulanger’s blog post. While the context is a classroom, the ideas presented in that post extend to interpersonal communication in any setting. Being able to use these phrases naturally means hearing them in context many times, and reflecting the tone of voice used by native and proficient speakers when using them. Tone of voice is significant in how these phrases come across! Videos can be helpful examples of when and how to use these phrases. As you watch real-world conversation from native sources like movies, commercials, interviews and TV shows, in FluentU video clips, “favorite” or otherwise save those words and phrases that most interest you. You can assemble them into personal vocabulary lists for active practice. Work through them in Learn Mode. Let yourself really listen and absorb what you hear, and let that lead you into speaking them. Though the examples below are meant to help give a sense of context to these phrases, it’s still much better to hear them in the midst of real communication. The aim of this short introduction is to get you started. You may also consider making a short list of a few responses that you enjoy. Post them somewhere you’ll see often. A list on your phone? Maybe a note by the bathroom mirror, or on the refrigerator door? Starting with only two or three, and adding two or three more when you retain those first few, would be better than trying to memorize a long list all at once. If you find lists work for you, you can even make a chart to show your progress with phrases you’ve just begun to work with, those you know fairly well and those you’ve really mastered. For Chinese, working first with the pinyin for these phrases would be enough. Later, as the phrases are familiar by sound, you could replace the pinyin with characters and develop your reading ability, too. Adding colors to your pinyin may help you recall tones better. There’s more than one way to color-code tones; try and see which you prefer. The sites in the three links in this paragraph will allow you to type and get pinyin for Chinese words with a color automatically added to each tone. Copy and paste the results into a document you can print or view on a device. I’ve translated these Chinese interjections and rejoinders into the closest equivalent American English phrases I could come up with, rather than more literal translations. Situational examples further clarify their meaning. 1. 那当然了! nà dāng rán le! You totally agree, and the setting is probably rather lighthearted. Situations might include things like: A friend remarks that it’s raining again (during the rainy season); you’re asked if you’d like to join some coworkers to your favorite restaurant for lunch; or someone brings up how expensive a new BMW is. 那当然了! could be a good response to all of those situations. 2. 太可惜了! tài kě xī le! Often, Chinese people who know English use “what a pity!” when they’re expressing this sentiment. You show empathy about a disappointment. Examples: A friend has to cancel social plans in order to work late; at a shop, you find a shirt you like, but your favorite color is out of stock; your reservation at a restaurant got mixed up and you’ll have to wait 15 minutes for a table. 3. 好好休息! hǎo hǎo xiū xi! This might be said to someone who just said they’d gotten sick, or who has just finished a huge task—like exam week. Examples: A fellow student seems to have developed a cough; a coworker talks about all the extra hours put in for a sales presentation just completed; someone is about to get a week’s break from school. Someone has shared sad personal news, extra demands at work or school, or similar difficult circumstances, and you share empathy with them by encouraging the person not to forget to care for oneself in the midst of those difficulties. This phrase’s use overlaps with 好好休息! above. This is an understated phrase, though warm, and sometimes seems used for praise that comes somewhat unexpected. Situations might include: someone did a bike trick pretty well; your friend shows you their non-expert but decent sample of calligraphy; you’re eating Western food at a restaurant in China. I may be revealing my age by using “awesome” as an English equivalent of this interjection. In more modern American slang, “sick!” is used in the same way. This is probably used to praise another person for something they’ve done. Examples: someone is a great dancer; a friend gave you a really complex origami your friend folded for you; a driver maneuvered through chaotic traffic skillfully, preventing you from getting stuck in a traffic jam. The news was good, and you’re celebrating! 哇噻! seems more common in the northeast of China; I heard 哇! more where I’ve lived in Southwest China. Examples: Your friend got a great price for that cute, new purse she has; what a great score your friend earned on a test; you just learned what a great singer your friend is during karaoke. Simple, and easy. Feel more thankful? Repeat as 谢谢, 谢谢! or 谢谢你 (xiè xie nǐ) or 太谢谢你! (tài xiè xie nǐ) (with emphasis on 太). Note that among friends and family, saying thanks directly comes off as too formal or distant. But with people you don’t yet know well, certainly do use it. 9. 你辛苦了! nǐ xīn kǔ le! or 你太辛苦了! nǐ tài xīn kǔ le! Here’s a classic way to thank a person who has helped you by doing something for you. It might be well-suited to thanking someone for preparing a wonderful meal, to thank your child’s teacher or in thanking someone who hosted you and took care of your needs during a visit. 10. 你想得这么周到! nǐ xiǎng de zhè me zhōu dào! Someone has shown great attention to your needs or preferences. Perhaps he or she sent you flowers, made you your favorite meal when you visited or took care to prepare every detail of travel arrangements for you. “Not at all.” (as a humble response to a compliment). This is a famous Chinese phrase meaning, “Where? Where?” suggesting that you can’t see anything so worthy of another’s thanks or praise. However, it seems less common with younger Chinese, and even with older generations of Chinese, it can come off as too insincere if overused. Examples: a stranger says your Chinese is very good; someone praises some task you’ve done for them; someone compliments your skill or style. 12. 不敢当! bù găn dāng! You’ve received some praise, and defer it by saying you “don’t dare to be” as excellent as their praise suggests. This feels somewhat more formal than 哪里，哪里. Situations for this phrase may include when someone introduces you as a non-native Chinese speaker with incredible Mandarin, someone says you’re the best mom or dad they know or a coworker suggests that you’re certain to be promoted since you’re so talented and hard-working. 13. 彼此彼此! bĭ cĭ bĭ cĭ! Someone has complimented you, and you politely receive the compliment by saying that they, too, are worthy of the same praise. However, the Chinese is more formal than the American phrase “back at you!” Don’t say this to someone who’s your boss or other authority figure, use the above mentioned 不敢当! instead. Examples: A peer coworker compliments your excellent work, a friend you often visit for dinner compliments your cooking skills or sometimes tells you how nice you look today. 14. 我还在努力! wǒ hái zài nǔ lì! More literally, this means “I’m still working hard.” Someone has complimented your (fairly functional) Chinese or other skill, and you reply by suggesting you’re still working at that skill. This is my own preferred way to defer any compliments about my Chinese, because it feels so real to me: there truly is always more to know and improvement to be made. Any skill from performing music to language ability to playing a sport could be in view with this response. Examples: you just stepped in something; you dropped your coffee cup; you stubbed your toe; or you had a bad hair day you can’t fix. 16. 真讨厌! zhēn tǎo yàn! Expressing disgust for what you heard described, or what you just saw: a nasty bug just crawled across the floor; your trashcan is really smelly; or someone’s behavior is inappropriate and rude. 17. 真没想到! zhēn méi xiǎng dào! This response shows you’re listening to someone telling you somewhat surprising news, whether good or bad. Examples: you arrive at a popular restaurant only to find it’s closed; every weather report predicted snow, but instead the weather is sunny and warm; or the parking garage at the mall has filled on a weekday early afternoon. Something turned out differently than previous expectations or experience suggested. Examples: your friend corrects your confusion about the meaning of a Chinese word; your landlord points to a clause in the lease that shows why you’re expected to pay six months of rent at a time; or someone explains to you about different Chinese regional cooking styles. These are perfect for keeping the ball rolling, even if you need to fake it a bit. 19. 真的吗? zhēn de ma? Showing that what you heard impressed you in some way, and you want to hear more about it. Appropriate situations: A friend tells you he signed up for an online dating service; while shopping, your friend suggests you try on a blouse you aren’t sure about; a friend announces that she’s just gotten engaged. You really agree with the person you’re talking with. Perhaps you’re discussing what that flavor must be in the noodle dish you’re sharing, and he suggests it’s Sichuan peppercorn; after exercising, your workout buddy suggests that you must be thirsty; or someone asks if your apartment really is on the top floor of the building. A firm downward tone shows affirmation; a rising tone shows questioning or surprise. Using these interjections shows that you’re listening attentively without interrupting the other person speaking. Switching your version of “um” or “uh huh” to more Chinese-sounding interjections helps reduce some of the sense of social distance caused by different languages. Just don’t overuse them! Indicating that you’re going to rephrase what the other speaker said, but in your own words, to sum up and check that you understood. This phrase can also give you a moment to collect your thoughts (as in this Thai example). After hearing someone describe their opinion of a situation, you might use this phrase to introduce your rephrasing of their main points. These short interjections and rejoinders can demonstrate your ability to understand Chinese may be much stronger than your speaking speed and ability. Use these phrases to show you’re ready for conversation! Since you’ve made it this far, you’re obviously serious about learning to speak real-life, conversational Chinese. FluentU can help you with just that. 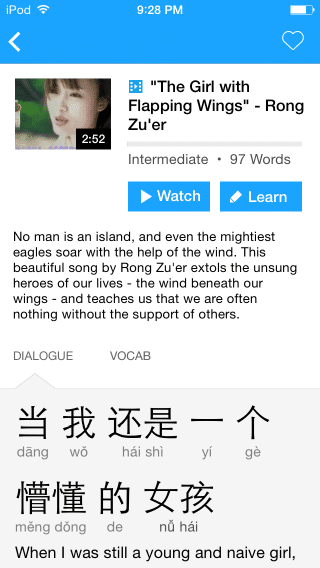 FluentU lets you learn real Chinese from music videos, commercials, news and inspiring talks. It naturally eases you into learning Chinese language, and you’ll learn Chinese as it’s spoken in real life. 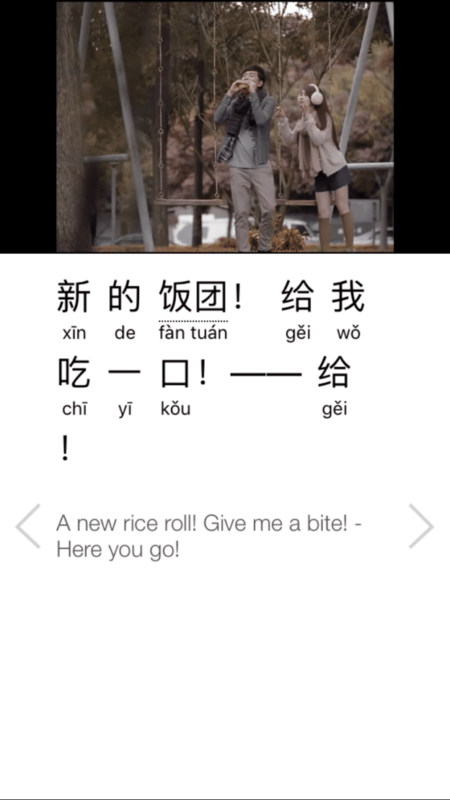 FluentU brings these native Chinese videos within reach via interactive captions. You can tap on any word to instantly look it up. All words have carefully written definitions and examples that will help you understand how a word is used. Tap to add words you’d like to review to a vocab list. From the description page, you can access interactive transcripts under the Dialogue tab, or review words and phrases under Vocab. FluentU’s Quiz Mode turns every video into a language learning lesson. You can always swipe left or right to see more examples for the word you’re learning. The best part is that FluentU always keeps track of your vocabulary. It suggests content and examples based on the words you’re learning. You have a 100% personalized experience.